Lexi Sobado, code named Lynx, is settling into a new job at Iniquus. The new position is satisfying: sort the random puzzles her team hands her to solve crimes, and, occasionally, support her team in the field - planting transmitters, sleight-of -hand, cracking a safe every once in a while, but nothing that would call for daring deeds of do or die. At least that's how her contract reads. Sadly, Lexi's life does't ever follow her carefully laid plans. Spyder McGraw, Lexi's long-time family-friend and mentor, shows up in town, bringing more questions than answers. A new neighbor, Maria Rodriguez, moves into Lexi's neighborhood - their pasts dangerously linked together. And grief as Lexi mourns her late husband, Angel, tangles itself around her feelings for Striker Rheas. At work, at home, in her heart, Lexi can't seem to find the sense of peace and security that she craves. ËƒËƒËƒ As old enemies surface, Lynx will fight until her last breath. Just as Lexi seems to move in the right direction, she becomes a pawn in a deadly international game. 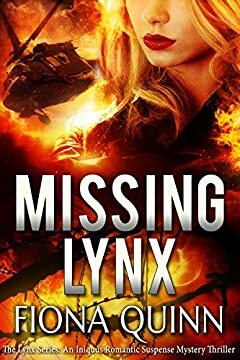 Lexi's teammates scramble to find her before it's too late. Lexi is fighting for her life.